The County operates under the Charter Home Rule form of government and the affairs of the County are managed by five County Council Members, one from each of the five Council districts defined within the County. Meetings of the County Council are held the first and third Tuesdays of each month in the evening at 6:00 PM in Room 110 of the County Office Building. The agenda and the minutes of each week’s proceedings are public record. With a goal of preserving the County’s rural atmosphere and uniqueness, opportunities abound to bring new, clean industries to the County to broaden and support the needs of the local workforce. 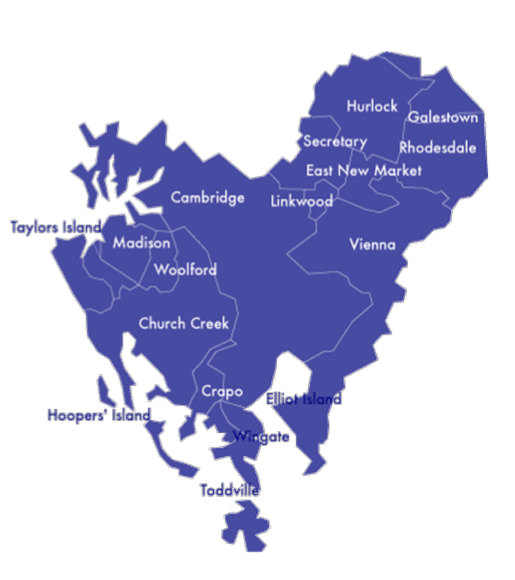 In an effort to attract new business, it is important to note that as the “Heart of Chesapeake Country”, Dorchester County is easily accessible by way of U.S. Route 50 from Baltimore and Washington D.C. The County is further accessible by way of U.S. Route 13 from the New England states, New York, Philadelphia, and areas to the south. Served by the Maryland and Delaware Railroad, the area is ideal for the location of businesses serving multiple locations. The area is also served by the Cambridge Dorchester Regional Airport and the Salisbury-Wicomico County Airport, a USAir site. Bordered by the Chesapeake Bay and the Choptank River, Dorchester County enjoys waterways which are navigable by barge and heavily used by sailing and yachting enthusiasts. Living here, it is sometimes easy to take the location for granted. Dorchester County enjoys some of the country’s finest seafood, most challenging wildfowl hunting opportunities, and breath-taking natural areas. Blackwater National Wildlife Refuge offers excellent opportunities to observe wildlife in their natural habitat. The Dorchester County Department of Tourism can provide visitors with up-to-date information regarding the events and points of interest that make Dorchester County a prime destination for travelers to the Eastern Shore. A tax exemption is in place for manufacturing and warehousing inventory. Enterprise Zone incentives are available. A five year phase-out of the personal property taxes on manufacturing equipment is underway. These incentives are significant to businesses looking to locate within the County and the County is examining other incentive programs to further promote the economic development of Dorchester County. Other key factors play into successful economic development. Training and educating potential workers is a major concern. This process starts in the local County school system with both academic and technological training. Alternative education opportunities are available at several private schools located in the County. Training may continue at Chesapeake College, a community college located in Wye Mills with a satellite campus in Cambridge, or at one of the many colleges and universities located within community distance including Salisbury University, the University of Maryland Eastern Shore, Wilmington College and others. Specialized training can be obtained at such facilities as the Center for Environmental and Estuarine Studies located only four miles west of Cambridge on the Choptank River. The Dorchester Career and Technology Center, located in Cambridge, offers courses in auto mechanics, body and fender repair, carpentry, electronics, horticulture, medical services, food services, HVAC service and repair, diesel and marine mechanics, welding and masonry. Dorchester County has a school system of which it may be proud – the challenge is to make sure that the young people completing their education have a place to work and an ability to enjoy a superior quality of life. The County seeks to continue to assist existing companies such as Bloch & Guggenheimer (pickle processor), Cambridge, International (conveyor belt producer), University of Maryland Medical Center, formerly Dorchester General Hospital (health care provider ), L’Air Liquide (a division of Liquid Air Corp. and a producer of specialty gases), and Visual Concepts Plus (fabricator of display furnishings). Assistance to existing companies ranges from tax abatements to communication and coordination efforts on the part of the County’s Economic Development Office with various State and Federal grant programs designed to accommodate existing businesses. Agriculture is a key industry in Dorchester County; again, it is an industry so much a part of the character of the County that care needs to be taken not to miss the opportunities to consider industries which can serve and compliment that very key component of the Dorchester County lifestyle and community. Marketing efforts are focused on industrial sites located throughout the County. Sites ranging from one acre to 150 acres remain available. The Town of Hurlock, located in the northern part of the County and at the center of the Delmarva Peninsula, has acreage available in its industrial park. There is also acreage available at the Dorchester Regional Technology Park located on Bucktown Road. Both the Chesapeake Industrial Park in Cambridge and the Hurlock Industrial Park have been designated as Enterprise Zones by the State of Maryland, providing other beneficial tax incentives to both employers and employees.